I've stupidly bumped my head! Should I go to sleep? What if I’ve stupidly bumped my head, my child or I? We are were fine…… aren’t we? We do all think; bumping, banging, hitting our head is fine. It’s just a bruise, a red mark. It’ll get better! Well in general, minor head injuries are common in people of all ages and generally we will get better and rarely resulting in any permanent brain damage. But what happens if it doesn’t? On rare occasions, a severe bumped head, if left untreated will be life threatening. On a sunny dry day, Fred started bouncing around on his sparkly, spanking new trampoline, which was brought for him for his 9th birthday. He was soo excited and couldn’t wait to try it out, after his dad built it to standard before it was safe to use. After the delight on his parents faces watching him, they went in to make dinner. They were happy, that their son was happy in their good choice of birthday present for him. What they didn’t realise was Fred fell off the trampoline and bumped the back of his head on the floor, without them knowing. “Oh heck”, said Fred. “I’ve stupidly bumped my head!” But Fred actually felt fine and carried on bouncing, well in fact throughout he did so the rest of the afternoon. Evening came, and off Fred went to bed. He started to moan of a headache and felt sick, he never mentioned about bumping his head to his parents. However they weren’t worried and brushed it off to all the bouncing and excitement of his trampoline and as it was his birthday. Luckily for Fred, his mom had first aid knowledge and was designated first aider at her work. She checked on Fred when she went to bed, like she always did since he was a baby. He didn’t look right, to touch he had flushed dry skin, and looked pale, even his breathing had slowed. She got her husband who called 999 straight away. When, the ambulance arrived, they said how lucky they all were. After their observations, they confirmed he is suffering a head injury – compression. That’s when they realised he may have banged his head from the trampoline earlier on in the day. Fred, was very lucky to make a full recovery after spending a few days in hospital, and admitted “I’ve stupidly bumped my head!”, and apologised to his mom. Concussion; is caused by ‘shaking’ of the brain. The brain is cushioned within the skull by fluid, so if the head receives a blow the brain can bounce from one side to the other, causing widespread disruption to its normal functioning. The casualty may become unconscious for a short period, after which the levels of response should remove. The casualty should recover completely if no complications are present. Memory loss (of the accident) and repeating things is common. Other signs and symptoms include vomiting, pale, clammy skin a mild general headache and nausea. May have a bruise or red mark to the skin of the head. 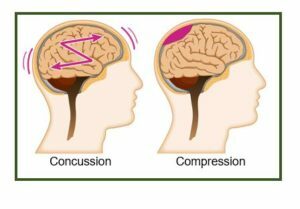 Compression; caused by bleeding or swelling within the skull, compression is a very serious condition, because the brain is placed under extreme pressure. The casualty could have a history of recent head injury with apparent recovery, but then deteriorates. Confusion and levels of consciousness becomes worse as the condition develops. Other signs and symptoms include vomiting, flushed, dry skin, intense headache and nausea. Fractured skull; is serious because the broken bone may directly damage the brain or cause bleeding, which in turn results in compression. Suspect a skull fracture with a person who has received a head injury, especially if they have lowered levels of consciousness. The child may also suffer from concussion or compression, so those signs and symptoms might be present. Other clues include swelling or bruising of the head, around one or both eyes, or behind an ear. If you would like more information about minor injuries, bumped heads or any information on our First Aid Courses, please contact us on 01543 453338 / 07506 906641 or email; info@hmbtrainingservices.co.uk. This entry was posted in aldridge, bumped head, Children's First Aid, courses, cpr, First Aid Courses, firstaid, paediatric, safeguarding, Stafford, Stone, walsall and tagged ambulance, bruise, bumped head, compression, concussion, courses, I've stupidly bumped my head!, red mark. Bookmark the permalink.